Looking for a small cross-body style bag to add to the collection. I find keeping my hands free in the winter is a must - probably the lugging of a jacket, scarf, gloves and hat are often occupying my hands. Plus, what girl doesn't I love having a stylish bag to run around with and one that will just catch all the necessities. These four are looking mighty nice and would fit the bill perfectly! #2 & #3 are the front runners...any tickling your fancy? Which would you choose? My vote is for the black Mulberry bag! Love all of your selections! Love all of these! I just bought a kate spade cross-body bag and I love having my hands free and no bag slipping off my shoulder! I'm all about number three! 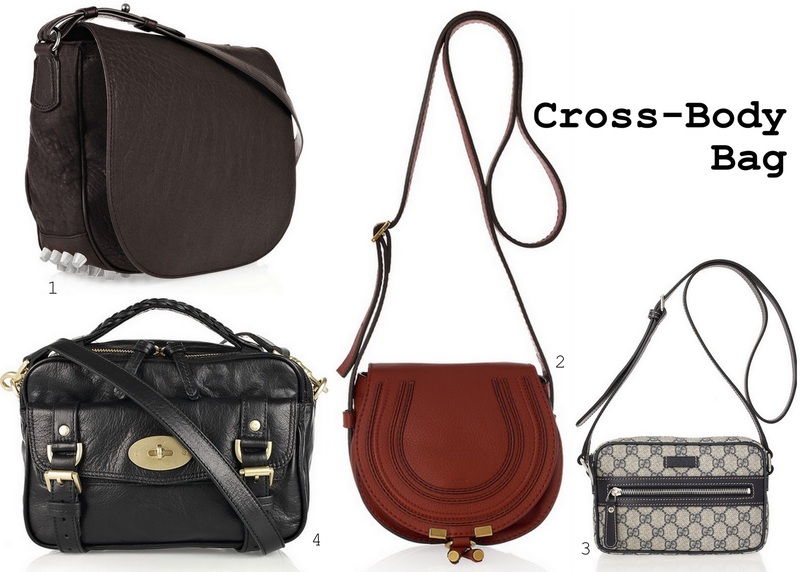 Love a good cross body- #2 is my fave! I love number 4! Super cute. I love #1 with the studs underneath!! I'd have to say #2...GORGEOUS! I am just now getting into crossbody bags - they just weren't my thing before. Nice finds! the black mulberry is my fav! I love 2 so much, but Mulberry bags are so deliciously classic looking. Can't go wrong with 2 or 4! I am obsessed with crossbody bags. Pretty sure I have about ten at this point. So functional and convenient! I love bag #2. I love the shape and the beautiful color. I agree, I have a crossbody bag from 7 years ago and still wear it all winter long! totally vote for the Chloe! can't get enough of that color!